A few weeks ago, I came across DiffSharp, an automatic differentiation library in F#. As someone whose calculus skills have always been rather mediocre (thanks Wolfram Alpha! ), but who needs to deal with gradients and the like on a regular basis because they are quite useful in machine learning and numerical methods, the project looked pretty interesting: who wouldn’t want exact and efficient calculations of derivatives? So I figured I would take a couple of hours to experiment with the library. This post is by no means an in-depth evaluation, but rather intended as “notes from the road” from someone entirely new to DiffSharp. Suppose I want to compute the derivative of f(x) = √ x at, say, 42.0. Double-checking Wolfram Alpha confirms that f has derivative f’(x) = 1 / (2 x √ x) . diff f 42. |> printfn "Evaluated: %f"
1. / (2. * sqrt 42.) |> printfn "Actual: %f"
First off, obviously, it worked. Without any need for us to perform anything, DiffSharp took in our implementation of f, and computed the correct value. This is really nifty. This is pretty interesting. Because we call diff on f, which expects Duals (a type that is defined in DiffSharp), our function isn’t what we originally defined it to be – and calling f 42.0 at that point (for instance) will fail, because 42.0 is a float, and not a Dual. In other words, DiffSharp leverages type inference pretty aggressively, to convert functions into the form it needs to perform its magic. So why is this interesting? As I mentioned earlier, differentiation is used heavily in numeric algorithms to identify values that minimize a function, a prime example being the gradient descent algorithm. The simplest example possible would be finding a (local) minimum of a single-argument function: starting from an arbitrary value x, we can iteratively follow the direction of steepest descent, until no significant change is observed. let g (x:Dual) = 3. * pown x 2 + 2. * x + 1.
minimize g 0. 0.1 epsilon |> printfn "Min of g at x = %f"
minimize h 0. 0.1 epsilon |> printfn "Min of h at x = %f"
Edit, 3/4/2015: changed function h to a simpler shape. I have barely started to scratch the surface of DiffSharp in this post, but so far, I really, really like its promise. While I limited my examples to single-variable functions, DiffSharp supports multivariate functions, and vector operations as well. The way it uses type inference is a bit challenging at first, but seems a reasonable price to pay for the resulting magic. My next step will probably be a less tiny example, perhaps a logistic regression against realistic data. I am very curious to try out the algebra bits – and also wondering in the back of my head how to best use the library in general. For instance, how easy is it to construct a function from external data, and turn it into the appropriate types for DiffSharp to work its magic? How well does this integrate with other libraries, say, Math.NET? We’ll see! In the meanwhile, I’d recommend checking out the project page, which happens to also be beautifully documented! And, as always, you can ping me on twitter for comments or question. I am still working my way through “Machine Learning in Action”, converting the samples from Python to F#. I am currently in the middle of chapter 6, dedicated to Support Vector Machines, which has given me more trouble than the previous ones. This post will be sharing my current progress: the code I have so far is a working translation of the naïve SVM implementation, presented in the first half of the chapter. We’ll get to kernels, and the full Platt SMO algorithm in a later post – today will be solely discussing the simple, un-optimized version. Two factors slowed me down with this chapter: the math, and Python. The math behind the algorithm is significantly more involved than the other algorithms, and I won’t even try to go into why it works. I recommend reading An Idiot’s guide to SVMs, which I found a pretty complete and accessible explanation of the theory behind SVMs. I will focus instead on the implementation, which was in itself a bit challenging. I am reasonably well versed in linear algebra, but figuring out what this is saying takes some attention. Granted, I have no experience with Python and NumPy, so my whining is probably a bit unfair. Still, I thought the code was not very readable, and it motivated me to see if that could be improved, and as a result I ended up moving away from heavy algebra notation. Then, the algorithm is implemented as a Deep Arrow. A main loop performs computations and evaluates conditions at multiple points, using continue to exit / short-circuit the evaluation. The code I ended up with doesn’t use mutation, but is still heavily indented, which I am not happy about - I’ll work on that later. Note: as the title of the post indicates, this is work in progress. The current implementation works, but has some obvious flaws (see last paragraph), which I intend to fix in upcoming posts. My intent is to share my progression through the problem – please don’t take this as a good reference SVM implementation. Hopefully we’ll get there soon, but this is not it, not yet. You can find the code discussed below on GitHub. This months’ issue of MSDN Magazine has an interesting piece on evolutionary algorithms. The article applies a genetic algorithm to identify the minimum value of a “pathological” continuous function, the Schwefel function. For X and Y values between –500 and 500, the “correct” answer is X and Y = 420.9687. This function is designed to give fits to optimization algorithms. The issue here is that the function has numerous peaks and valleys. As a result, if the search strategy is to use some form of gradient approach, that is, from a starting point, follow the steepest descent until a minimum is reached, there is a big risk to end up in a place which is a local minimum: the algorithm gets stuck in a valley with no path downwards, but there are other, better solutions around, which can be reached only by “climbing out of the hole” and temporarily following a path which heads in the wrong direction. The result was an abject failure – not even close to the true solution. I thought it would be interesting to see how Bumblebee, my Artificial Bee Colony framework, would perform. There are some general similarities between the underlying ideas behind the articles’ algorithm and Bumblebee, the main difference being that Bumblebee simply mutates individual solutions, and doesn’t create “crossover solutions”. Let’s open Visual Studio, create an F# Console project, grab the NuGet package for Bumblebee – and start coding. As usual, we need 4 elements to leverage Bumblebee – a Type of Solution, and 3 functions: a Generator, which returns a brand-new, random solution, a Mutator, which transforms a known solution into a new, similar solution, and an Evaluator, which evaluates a solution and returns a float, increasing with the quality of the solution. In this case, the Solution type is fairly straightforward. We are looking for 2 floats x and y, so we’ll go for a Tuple. Similarly, the Evaluation is a given, it is the negative of the Schwefel function. The reason we go for the negative is that Bumblebee will try to maximize the Evaluation, so if we are looking for a minimum, we need to reverse the sign – because the Minimum of a function is the Maximum of its negative. There are N starting points (purple) and N target points (green) in 2D. 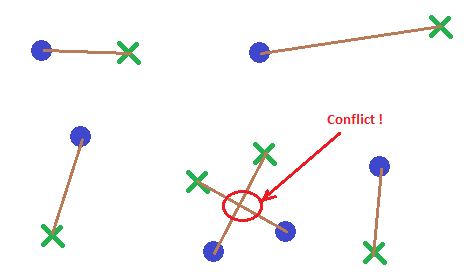 I want an algorithm that connects starting points to target points by a line segment (brown) without any of these segments intersecting (red) and while minimizing the cumulative length of all segments. I figured it would be fun to try out Bumblebee, my artificial bee colony library, on the problem. As the accepted answer points out, the constraint that no segment should intersect is redundant, and we only need to worry about minimizing the cumulative length, because reducing the length implies removing intersections. We’ll start with a silly problem, where the 2 lists are identical: the trivial solution here is to match each point with itself, resulting in a zero-length, which will be convenient to see how well the algorithm is doing and how far it is from the optimum.